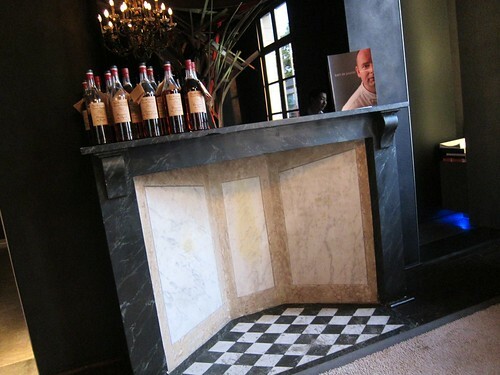 It is mighty impressive how much quality there is in the region of Flanders. 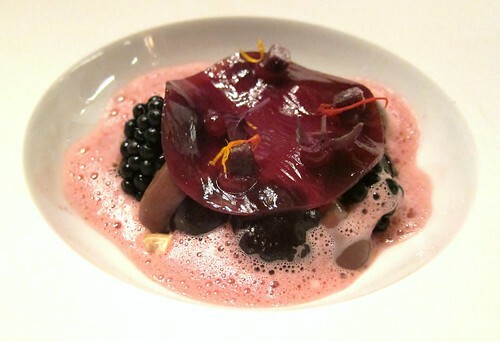 Numerous top restaurants, and one of the very best is Pastorale. Chef Patron Bart De Pooter and his wife Marie-Claire Braem are representatives of the very finest from Flanders and the best keepers of the Flemish culinary heritage from the past and into the future. 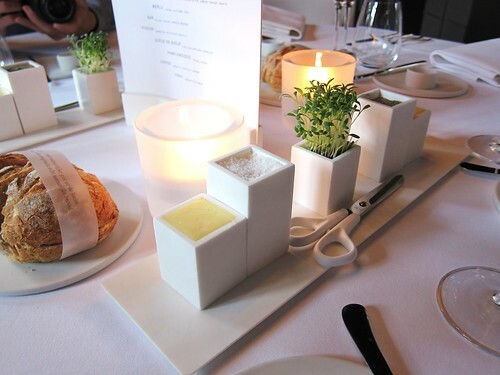 The level of innovation and playfulness of textures and flavours is at its best at Pastorale. The Chef and his team seem to have an endless source of inspiration to constantly develop new concepts, ideas and recipes. The refinement of the cuisine and the endless securing of the very best produce is something your taste buds will worship. Most of the produce comes from nearby, but the most impressive of all the ingredients is the amazing meat coming from the Dutch butcher Glosschalk in The Netherlands. There are several meet dishes to sacrifice a finger for like the beef Holstein that is five years old and dry aged for 50 days. 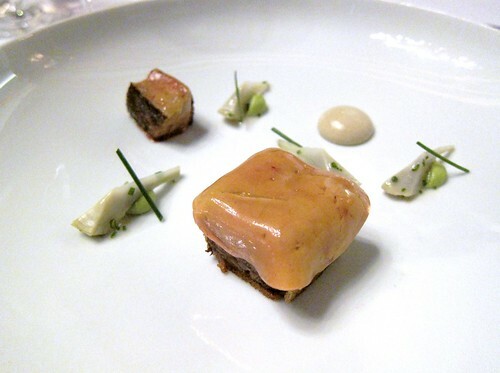 Of course there are many other kinds of ingredients than just meat dishes, like the turbot that is grilled on the bone with béarnaise and langoustine or the delicious hake with smoked milk, cockles, razor clams and celery. 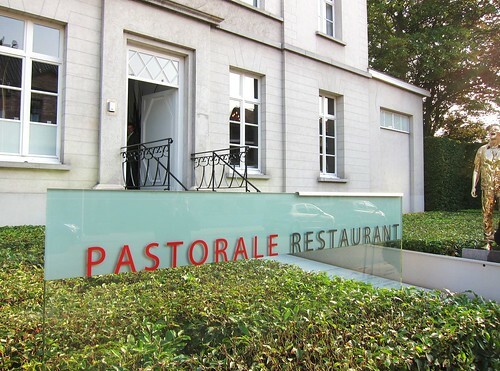 Pastorale is located close to Antwerp and Brussels in the small town of Reet. 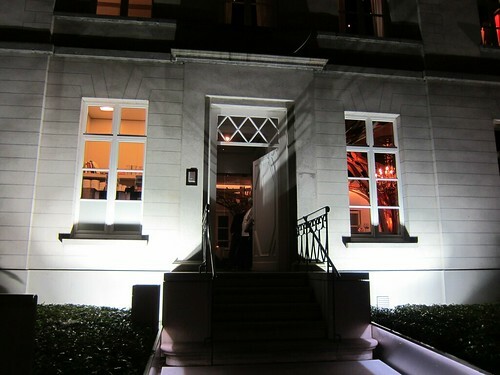 You will find the restaurant at a former presbytery, but it feels more like entering a grand villa or a château. You might think that this food temple is stiff and too much into traditional luxury, but you are wrong and will notice that even before you enter the restaurant. 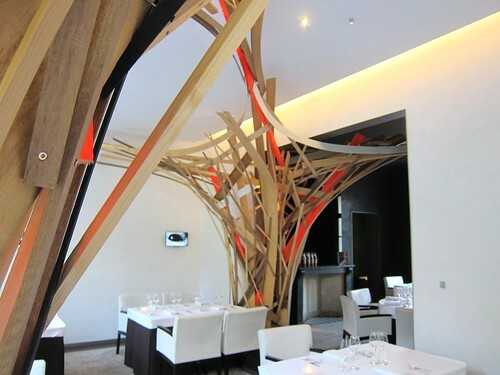 A modern bronze statue is standing by the entrance which starts a laughing sound once you pass by and you will immediately notice the art installations by the Belgian artist Arne Quinze when you enter the main dining room. 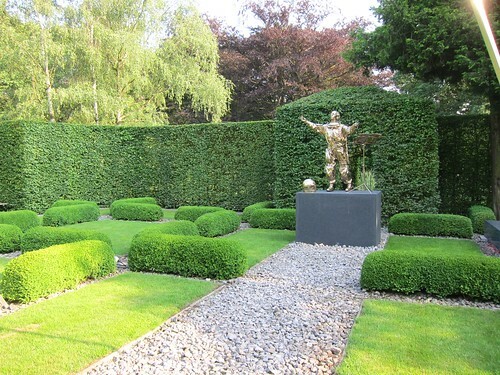 The art is present both outside and inside at Pastorale – from the first second at the entrance to the time spent in the garden filled with contemporary statues. 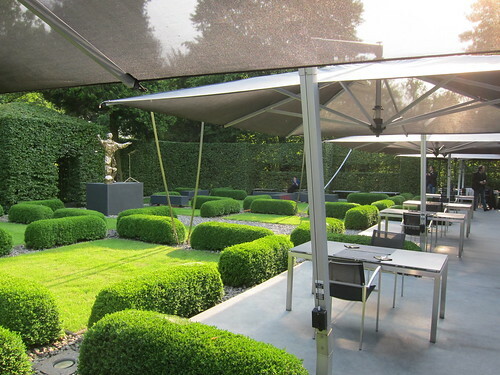 Chef Patron Bart De Pooter and his team have refined Pastorale for many years now and they are still developing. 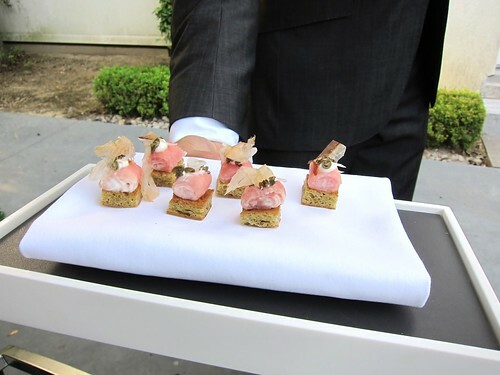 The culinary movement towards low fat and sugar continues, the phases in the service become more polished with less ketchup effects of everything coming in at once after long waits. The wine list which has always been great just gets better. Pastorale is not the typical fine dining experience, no, it is more than that – it is a refined experience which gives all your senses a pleasant massage to cherish and remember for the rest of your life. Bart De Pooter, de chef van De Pastorale in Reet, is door de restaurantgids GaultMillau uitgeroepen tot Chef van 2012. Het restaurant Volta is de Ontdekking van het jaar. Volgens GaultMillau verdient Bart De Pooter van De Pastorale de titel Chef van het Jaar omdat hij 'zijn passie voor esthetiek en creativiteit in zijn realisaties combineert met een grote rechtlijnigheid op het vlak van producten die gerespecteerd en ideaal bewerkt worden'. Bij de Jonge Topchefs vermeldt de culinaire gids Pierre massin (Chai Gourmand, Gembloers), Diùmitry Lysens (Magis, Tongeren) en Thomas Locus (Bistro Margaux, Sint-Martens-Bodegem). In de jaarlijkse ranglijst van de culinaire gids zijn er drie nieuwkomers die een scoren van 18 op 20 halen. Het gaat om De Pastorale in Reet, 't Fornuis in Antwerpen en De Jonkman in Brugge. 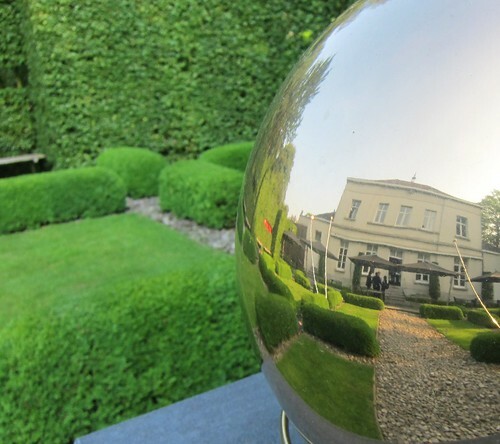 It is within a former rectory which rather resembles a château-like mansion that Bart de Pooter and his wife Marie-Claire have found a home for their restaurant De Pastorale. This sounds very conservative at first, but one realizes quickly that this classic building is actually an elegant container for modernism. 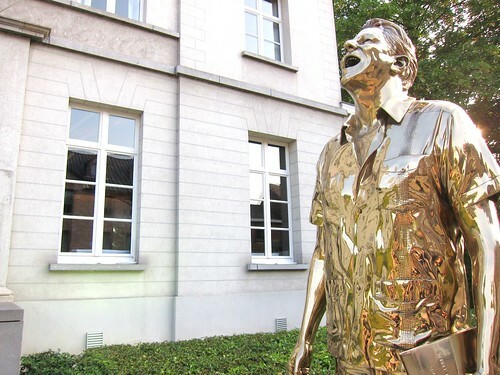 A first indicator of this dualism is given by a modern bronze statue at the entrance which emits a laughing sound once you pass by. But it truly becomes clear once you enter the house. At the left one sees very old wooden stairs that lead up to the first floor. And on the right one has to pass automatic slide doors to enter the main dining room: contrasts couldn’t be more opposed. And what a dining room! 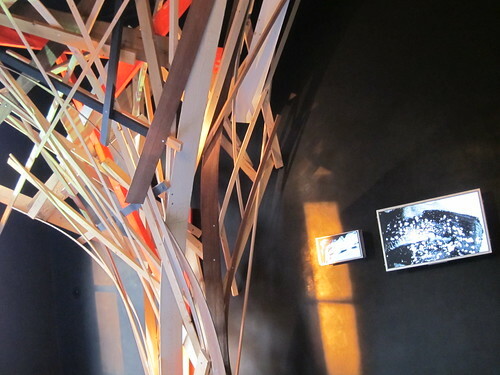 An immense art installation by Belgian artist Arne Quinze made of connected wood planks is growing through the 2 areas of the salle. This installation is completed by digital screens showing black and white videos of moving lips made by the same artists. Some found it a bit irritating but I thought it definitely captures your attention and puts your senses in an awaiting mode. Once you crossed the dining room, on the other side of this symmetric mansion, another door leads onto the terrace with a garden that is arranged with equal symmetry and reminds a bit the likes of Versailles with its carefully cut bushes and hedges. What a beautiful environment! And again, modern art is included with huge red puppy plastics watching you from the side and an orchestra director bronze in an astronaut suit facing the terrace. One is quite overwhelmed with all these visual impressions. To an extent that the main purpose of our visit is blanked out of our heads for a few minutes. But once we were warmly greeted by Marie-Claire de Pooter, Bart’s wife, we found back to reality. The two had started De Pastorale in 1991 when Bart was only 23 years old. And 15 years later he was the youngest Belgian chef with 2 Michelin stars. Impressive. As for his cooking style, I didn’t know what to expect since it was my first visit, gladly joining my dining friends of Gastros on Tour to a generous invitation by the Chef. But the contrasts and humouristic touches, the elegantly classic next to the creative modern maybe are a hint: would a cuisine of contrasts await us? What a beautiful terrace for having a glass of Champagne and some nibbles! And it truly was a cuisine with contrasts that awaited us. But also a cuisine of great generosity. Where else are you greeted with such an impressive series of amuses? Incredible how much thought and creativity has gone into each of these little ones! 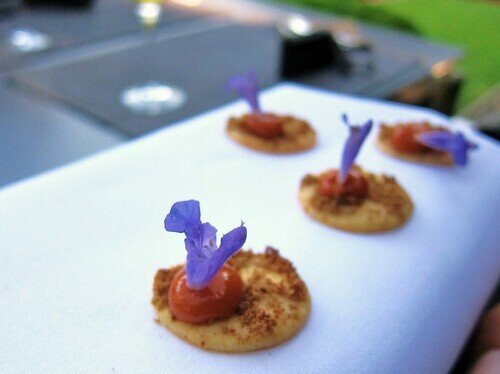 Sablé cracker, Tomato, Sage flower, a beautiful start with some crunch, and an intense tomato note stimulating our palates. Perfect with the Champagne! 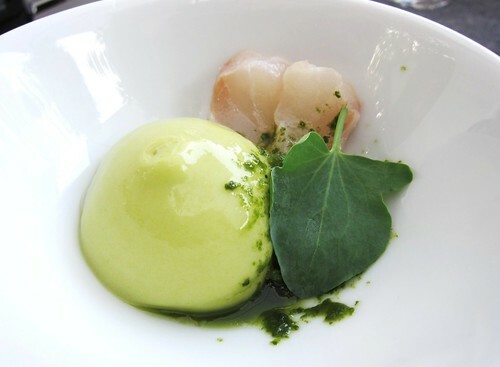 Raw Bass, Sorrel, Espuma of the sea, a wave of freshness, a bowl of moving ocean with acidic and tart notes and lots of purity. Canneloni of Kohlrabi, Sardine, Citron Confit has again a very refreshing effect on us. The Sardine appears very mild and pure and flavours of lemon zest and quark as well as comforting, pureed Kohlrabi are dominating. 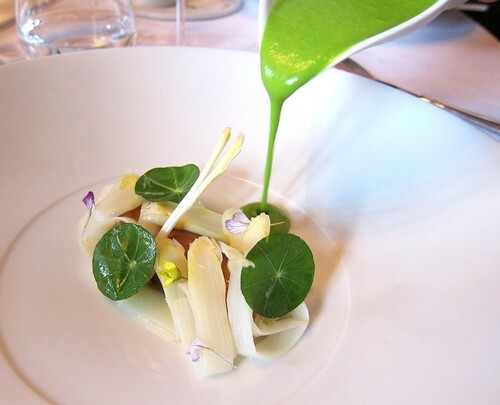 The slice of blanched kohlrabi of which the canneloni is made of adds a good crunch – playful textures! Focaccia, Veal roulade, Bonito flake, very clever and tasty. As Stéphanie remarked, this could be Vitello Tonnato reconstructed, but then with reversed roles. 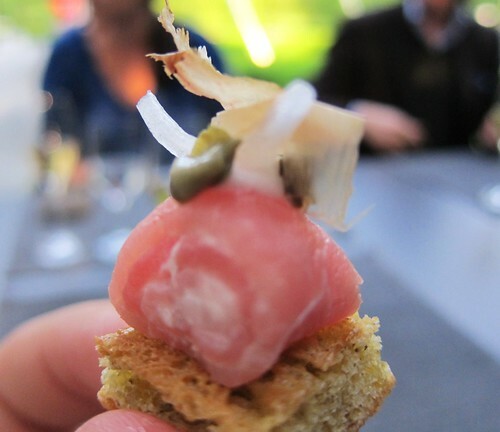 Here, the veal is creamy and the tuna, dried, acts as a condiment. 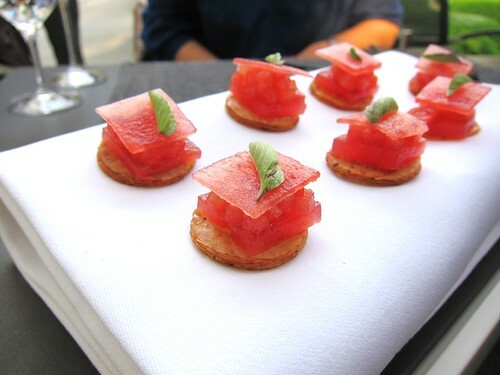 Tandoori cracker, Watermelon, Tomato, Basil, somehow reminds me of Greece, where watermelon is often paired with Feta cheese. Here the salty part is played by a well spiced cracker. Again, very clever and tasty. 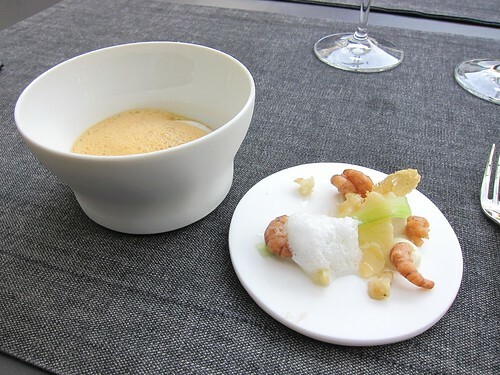 Brown Shrimp (crevettes grises) cold and warm, a surprising construction with, on the lid: cold shrimp paired with crunchy cauliflower bits and fruitful elements that are exciting the palate. Within the bowl a poached quail egg, mashed potatoes, mousse of shrimp fumet that act as the comforting part of this Amuse. Delicious and, needless to say, the shrimp was of excellent quality. Smoked aubergine, Parmesan, Young garlic, Parsley, as a final Amuse and I would say final gong before the start of the main meal. It smells a bit simple and one dimensional of grated Parmesan at first, but when you taste it, it strikes you with unreal intensity. Delicious aubergine purée, a cream of garlic with a hint of lemon. An excellent trick! A coup de maître! It was such that the taste was still lingering on our palates when we received our first course at our inside dinner table, a good 15 minutes later. What an impressive series of Amuses! Asparagus from Wechteren, Crab, Capucine - The asparagus are thinly cut, maybe just slightly blanched and of a sublime taste without any bitterness. 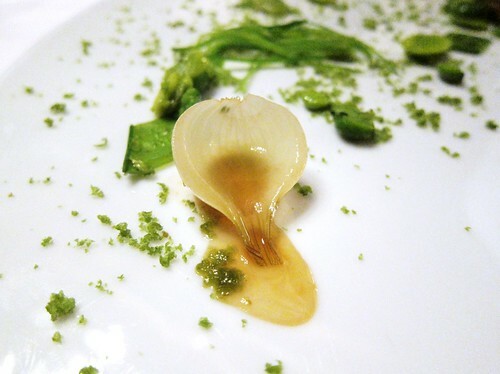 Then there is a great play on textures with the crunchy asparagus next to a velvety Capucine sauce. Finally, the tender and sweet crab is opposed to the tart and green flavors of the Capucine. 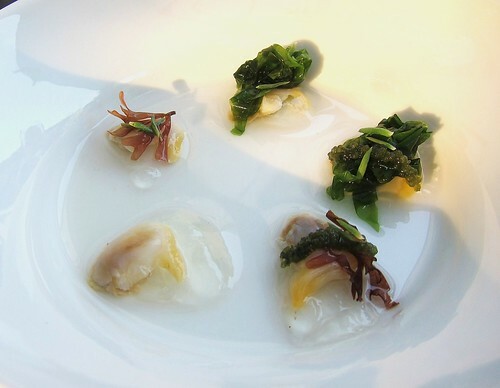 A dish full of freshness and opposites – I love it. Also, it is very well paired with a fresh and tart 2010 Grüner Veltliner from Weingut Stadt Krems from Austria (more reminiscent of Sauvignon Blanc actually). 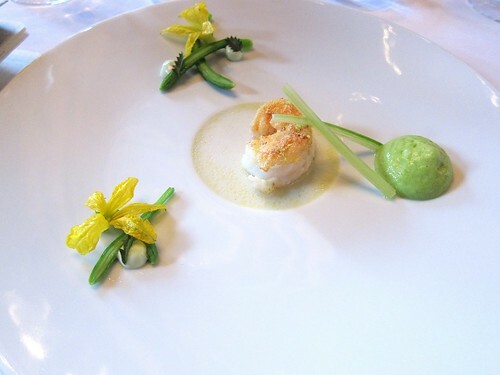 Langoustine, Lime, Cucumber, Courgette - The tender langoustine is covered with a very thin and crunchy coating of lemony spices. It is lying on a dressing of lime giving an instant acidic response. A dollop of courgette cream is warm and soothing. Then, a thin stick of celery adds crunch and freshness. 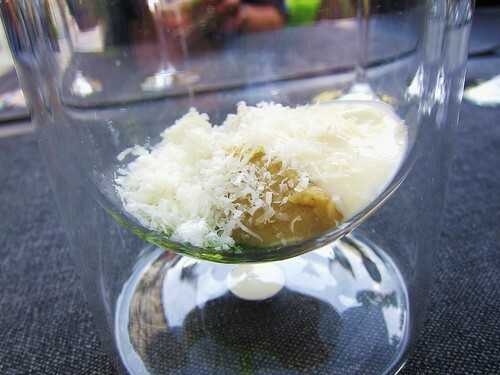 On the side, 2 drops of an intense lime-mayonnaise are adding a dimension of richness. 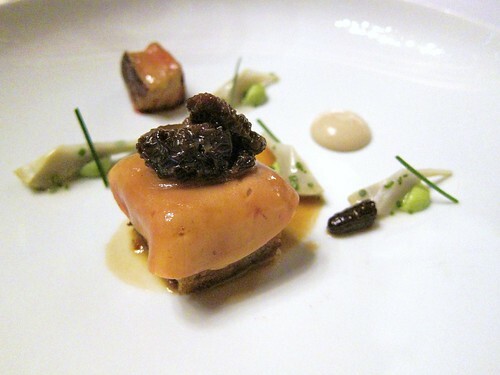 Again a superb dish, balanced and with subtile nuances. 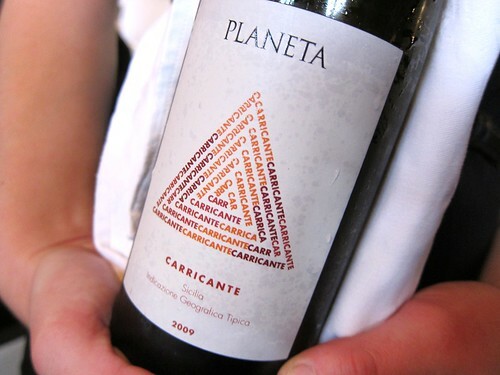 As a wine-pairing for the langoustine, an autochtone white varietal named Carricante from the famous Planeta winery in Sicily. A wine with very ripe fruit and quite some power that responded well to the lemony elements of the dish but maybe crushed a bit its more subtle aromatics. Nonetheless, an interesting discovery. 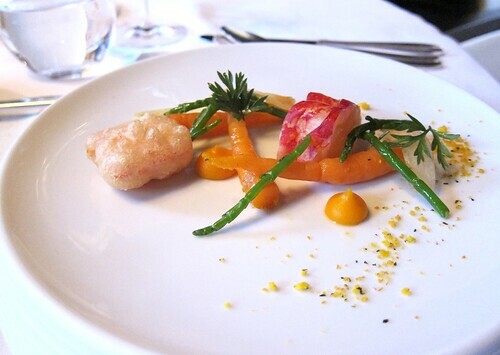 Lobster, Carrots, Honey, Salamanci, Saltwort (Salicorne) - A somewhat funky dish, where the slight orange-citrus taste of the Salamanci and honey are on the fore and the lobster with its calm and pure taste is a delicately hidden treasure on the plate. The Salicorne adds a crunchy textural element. And then there was a grandiose wine pairing with a 2008 Kesseler Riesling Kabinett trocken from Rheingau showing a nice acidic freshness. Eel, Quinoa, Pine nuts, Jabugo ham, Navets (Rutabaga) – Good bite to the eel which is slightly coated with soy sauce. 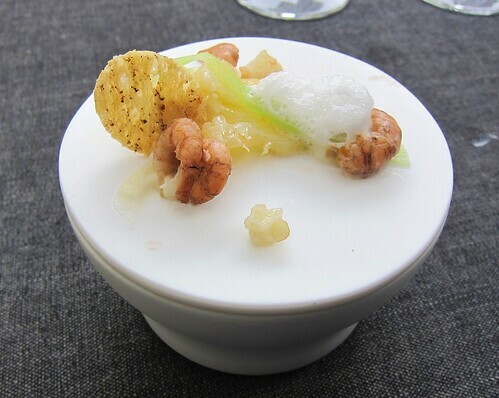 Then a dollop of luscious horseraddish foam and crunchy quinoa on the side with some raddish and the rich feel of pine nuts make for a well balanced ensemble. The Pine nuts seem to be the binding element. They are representing the most long lasting flavor on the plate and create a charming link without overpowering. An excellent dish! 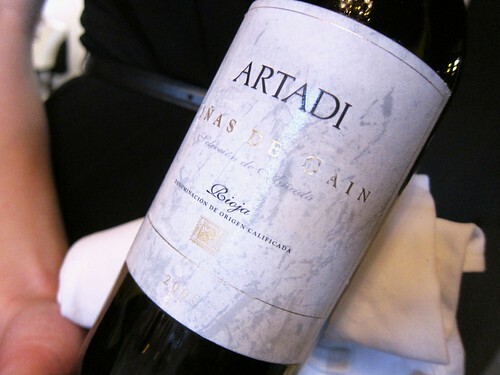 This 100% Viura grape white Rioja by Bodegas Artadi was slightly oaked and went very well with the smoky flavours of the eel. 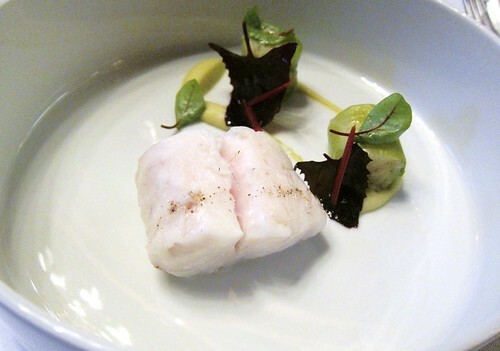 Hake (Merlu) poached in smoked milk, Cabbage – Wow! What pure and calm expression of fish. First of all it is perfectly cooked. Then it is only marked by the slightest vanilla-like hint of smoke and the mild cabbage adds a comforting component that makes it an ultra-yummy dish. 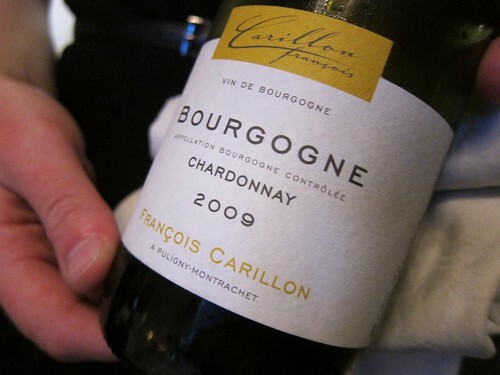 2009 Chardonnay by Francois Carillon showed elegant smoke-like oak notes and became more and more pertinent with the fish as it opened up. 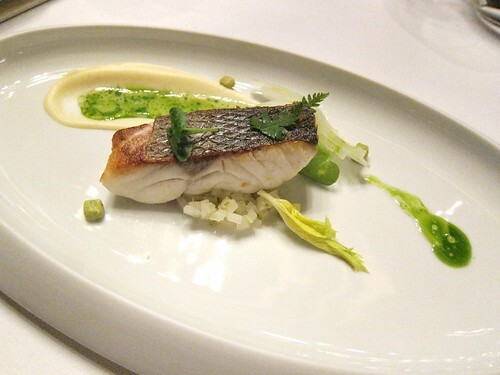 Bass, Celery, Lovage, Cicely (Cerfeuil musqué) - is again very well cooked and elevated by an acidic preparation of crunchy celery brunoise on which it is lying. The calm and richer part is played by a purée of bulb celery. 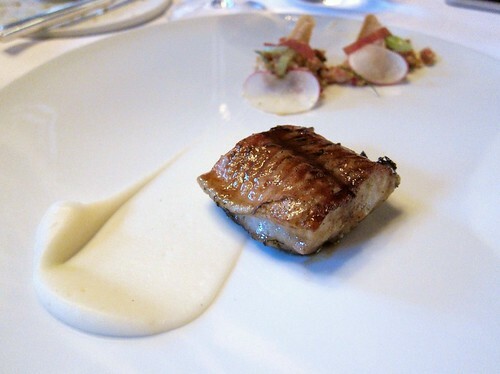 Again a dish full of contrasts, here with slight acidic accents which are instantly appeased by a comforting element and at the center a piece of fish that is shining of purity. Sublime balance! What a perfect succession of seafood dishes! 2009 Hallgartener Hendelberg by Peter Jakob Kühn from the Rheingau region. A great Riesling, with such an intensely exotic nose I’ve mistaken it for a Chenin Blanc at first. Crazy fruit for this dry wine, but at the same time this is so 09! By the way, lovers of German Riesling will enjoy the winelist with for example a few of Breuer’s dry masterpieces on offer. 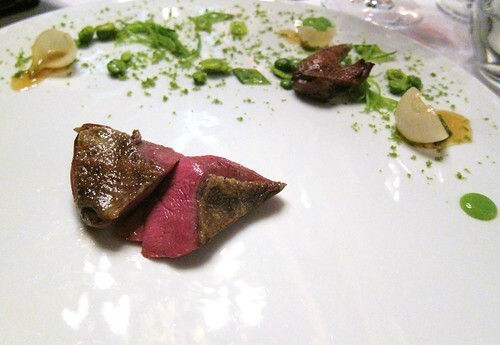 Pigeon, Barbecue, Green peas, Nacelle - The focus is definitely on the pigeon and its perfectly executed cooking. The meat is tender, juicy and with great flavor. Green peas are a harmonious background melody and some lightly fresh mint-notes here and there add some welcome punctuation. 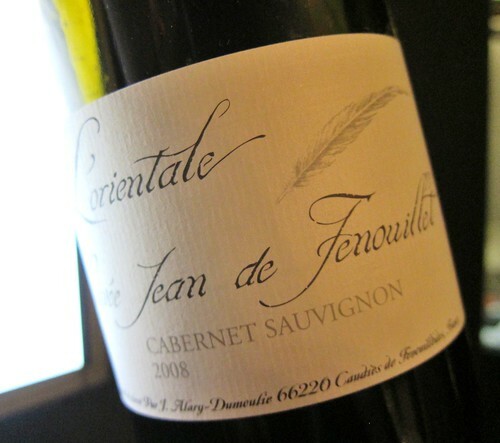 2008 L’Orientale, Cuvée Jean de Fenouillet, Domaine Alary-Dumoulie – A Cabernet Sauvignon from Southern France I wasn’t familiar with. We tasted it blind and only a slight hint of bellpepper in the nose indicated the varietal. A very juicy wine that was a good match with the pigeon. Ox tail, Goose liver, Artichokes, morilles - The Ox tail shows some crunch and is paired with velvety goose liver and sensual morels. Again some accents are added by small bits of artichokes on the (recurrent but pertinent) acidic green mayonnaise. 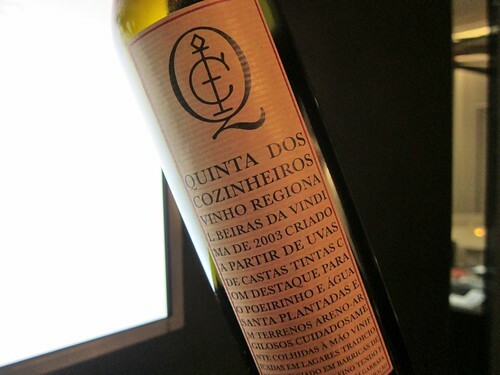 2003 Quinta Dos Cozinheiros – a Portuguese red wine which I haven’t encountered before. Its intensity and fruit remind a bit of the Syrah grape. Grapefruit, Spices, Acacia - What a great refreshing dessert! Incredible contrasts between bitter, sour, crunchy, mellow , delicate, juicy, jelly-like as well as between cold and not cold. This is exactly the refreshing explosion that we needed. You couldn’t announce a new phase of the meal more clearly than that. 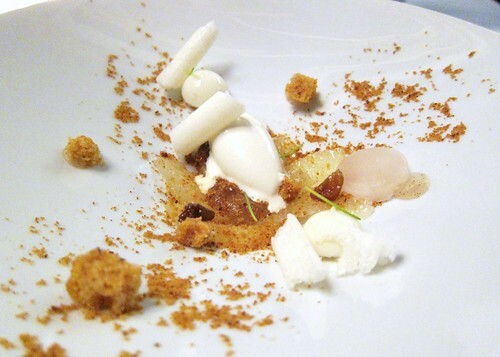 Also this type of complex dessert reminds me of Alex Stupak who used to be the pastry chef at WD-50 in New York. Cherries, Hazelnut, Chocolate, Caramel - After the refresher comes the comforting dessert, where contrasts are less on texture but rather on opposing mellow and voluptuously creamy chocolate with fresh and acidic cherry juice. The hazelnut flavors represent a superb third element here. Again: delicious! Wow! What a superb succession of desserts to end this meal. 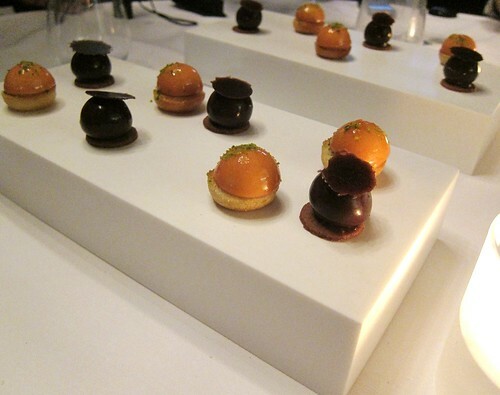 This was cleverness and virtuosity at the same time and personally the best 2 desserts in a row I had for a long time. Great! 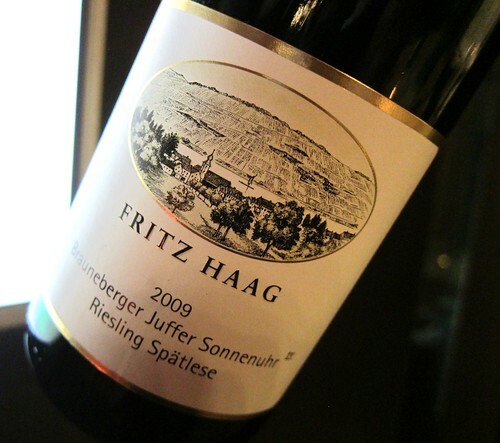 2009 Brauneberger Juffer Spätlese by Fritz Haag – very young but with compelling deliciousness. What a nice dinner! There were so many aspects about it that I enjoyed, starting with the meticulously elaborated series of Amuses that in itself already represented a tiny degustation menu. Then there is this perfectionist quest for contrast and balance in each single dish that impressed me. Contrasts in texture, temperature, flavors, acidity are to be found in every creation and they are truly one of the foundations of world class cooking in my opinion. After all these courses it became clear that Bart De Pooter puts a lot of thought in his dishes and applies a lot of sense to his creativity. One could say that he has found clever ways to structure his creativity. But there is more than that if you want to describe his cuisine. Ingredients, of course, play a key role and local sourcing is applied when possible. Needless to say that the quality of ingredients was irreprochable and even sublime. Especially the fish and seafood dishes were of highest freshness and also cooked with such exactitude that they certainly represent the highlights at Pastorale. Then I have to mention the young and friendly staff who made every possible effort to make us feel at home. Especially the young co-Sommelière made us very happy by serving every wine blind plus she chose some very interesting wines that were unknown to many. And as I already mentioned before: the wine list contains quite some gems for lovers of Riesling. So to put it in one sentence: this was a visit that literally touched all my senses and left me perfectly satisfied. And in my humble opinion Pastorals is a restaurant that clearly deserves its 2 stars but at the same time I suspect is very close to its third one! So, thanks again for this generous dinner and hospitality. And Thanks Laurent! PS: For a beautifully poetic report in French with sublime photos, check Stéphanie’s blog. Bart De Pooter, de chef die zowel door Michelin als GaultMillau op handen wordt gedragen, begint op 1 september met een luxebrasserie op de Brusselse Grote Zavel. Dat belooft een hypergestileerde plek te worden, temidden een showroom van Mercedes-Benz. et moet in november geweest zijn. 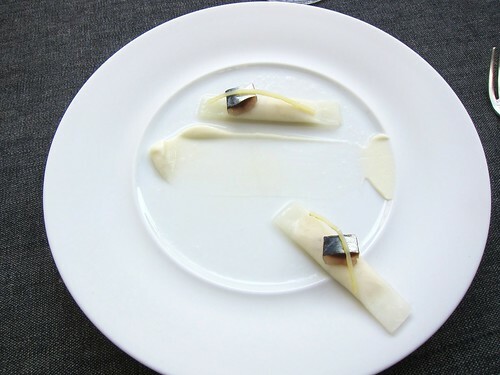 De culinaire gids GaultMillau had hem net tot Chef van het Jaar uitgeroepen. Zijn tweesterrenrestaurant De Pastorale draaide op volle toeren. Toch vond Bart De Pooter nog ergens een gaatje in zijn agenda om te gaan koken op een evenement in The Mercedes House, de luxueuze showroom van Mercedes-Benz aan de Grote Zavel in Brussel. De meeste chefs pakken dat soort opdrachten heel pragmatisch aan: koken, inpakken en weer naar huis. Maar zo zit Bart De Pooter niet in elkaar. Tijdens het evenement raakte hij geïntrigeerd door het pand aan de Grote Zavel. Door de ligging ervan, pal in het centrum van Brussel. En door de kwaliteit van de architectuur. Daarmee blijft de chef beleefd. The Mercedes House is opgezet als een plek waar klanten en mogelijke klanten kunnen kennismaken met de wereld van Mercedes. De automaker lokt ook al jaren volk naar zijn luxueuze vitrine door geregeld concerten te organiseren meestal met klassieke muziek of jazz. Gasten kunnen er nadien zelfs een driegangendiner aan koppelen in een kleine brasserie. Maar dat gebeurde allemaal wat in mineur. Kasten met accessoires belemmeren het uitzicht op de auto’s. De piano staat in een donker hoekje. En ook de brasserie is niet meteen een plek om vrolijk van te worden: een paar saaie tafeltjes met uitzicht op de achterkant van een Mercedes A-Klasse. In plaats van die bewuste avond dus gewoon in te pakken en weer naar huis te gaan, raakte De Pooter in gesprek met een paar Mercedes-mensen. Wat hij gezien had, hadden zij ook al gemerkt: van dit pand is meer te maken. En in één moeite vroegen ze de chef of hij niet wilde meewerken aan de make-over. De spectaculairste ingreep bij die make-over wordt WY, een nieuwe luxebrasserie waarvan de naam verwijst naar de Y-vorm van het gebouw. Zijn bijkomende vestigingsplek leek Bart De Pooter eerst in Hongkong gevonden te hebben: een grote hotelgroep vroeg hem in 2008 om in een van haar hotels een kopie van de Pastorale neer te zetten. Toen de financiële crisis daar anders over besliste, overwoog De Pooter even om zijn kandidatuur in te dienen voor de uitbating van de brasserie in de Brusselse Bozar. Maar ook dat deed hij niet. Maar vorig jaar dook de chef wél al even op in Brussel. Hij was een van de uitbaters van The Cube, een even spectaculair als tijdelijk glazen restaurant hoog op de Triomfboog van het Jubelpark in Brussel. In die glazen kubus kookte De Pooter niet alleen. Hij toonde er ook dat hij een restaurant ziet als een geheel. ‘De indrukken die je in een restaurant opdoet, kunnen je eetervaring versterken.’ Zo liet hij een verticaal meubel voor verse kruiden maken. En gasten kregen er een iPad in handen. Die konden ze niet alleen gebruiken om het menu te raadplegen, maar ook om er foto’s van zichzelf mee te mailen. Dat een restaurant een totaalbeleving kan zijn, is nu al te zien in de Pastorale zelf. Door kunst van onder meer Jan Fabre en Arne Quinze een centrale plek te geven, wil De Pooter in zijn eigen restaurant aantonen dat eten een ervaring is die meerdere zintuigen aanspreekt. En dat die ervaring al begint voor de gasten aan tafel zitten. De chef is iemand die graag uit zijn keuken komt: zo ontwierp De Pooter al vazen voor zijn restaurant en hing die eigenhandig op aan het plafond. Samen met Franky Claeys, een ontwerper die zowel voor Justin Timberlake als voor The Cube, Nike en Philips heeft gewerkt, is de chef voortdurend bezig om de Pastorale een aparte visuele identiteit te geven. Om van WY de hippe, kosmopolitische brasserie te maken die hij in zijn hoofd had, schakelde De Pooter opnieuw zijn huisontwerper in. En die tekende plannen die WY recht de 21ste eeuw in katapulteren. ‘We willen de erfenis van het merk doortrekken naar de brasserie’, zegt Franky Claeys. Om dat te doen, tekende Claeys tafels en kuipstoelen die zó uit de fabriek van Sindelfingen zouden kunnen komen, mocht Mercedes besluiten voortaan ook meubels te maken. De dominante kleuren zijn chroom, zwart, wit en oranje, telkens referenties aan kleuren die ook in modellen van de Stuttgartse stal te vinden zijn. Ook in de verlichting van Matilde Alessandra, een Italiaanse ontwerpster die naam gemaakt heeft met lichtsculpturen, zitten verwijzingen naar die kleuren. WY krijgt een open keuken met drie chromen kookeilanden. Daarboven komen camera’s. De kookbeelden van de keuken worden live getoond op een wand achter de koks. ‘Op die manier kunnen gasten meemaken hoe een gerecht op het moment zelf gemaakt wordt’, zegt Claeys. Het wordt het enige restaurant in Brussel waar gasten via een scherm in de potten gaan kijken. Franky Claeys noemt zichzelf graag een ‘allround ontwerper’. Hij werkte met de legendarische Maarten Van Severen en ontwerpt vandaag alles: van winkelmeubels over wijnetiketten tot platenhoezen. Daarom wilde hij het bij WY ook niet alleen bij de inrichting van de brasserie houden. ‘Als we dan toch voor een totaalbeleving gaan, dan vond ik het ook belangrijk dat we over alle aspecten van een restaurant nadachten. En dus ook over de bediening.’ Wie in het restaurant opdient, zal dat doen in een outfit die geïnspireerd is door het F1-raceteam van Mercedes GP. Bovendien wil de ontwerper zijn relaties in de muziekwereld aanspreken om het live-entertainment in te vullen. In zijn adressenboekje staan zowel de nummers van Jasper Steverlinck als van Paul Buchanan, de frontman van The Blue Nile. WY zal op 1 september zijn eerste gerechten serveren. Omdat de openingsuren van de brasserie samenvallen met die van de showroom, zal WY 7 dagen op 7 open zijn. Bart De Pooter zelf zal op zijn vrije dagen mee komen koken. Koken op je vrije dagen? Is een tweesterrenrestaurant runnen al niet vermoeiend genoeg? ‘Je hebt mensen die liefst op vakantie gaan naar de kust. En je hebt er die liever bergen beklimmen. Ik ben een klimmer: ik kan me ontspannen door me voor iets in te spannen. Je kan dat een workaholic noemen, maar stilzitten is gewoon niet mijn ding.